My honey just called (7:12 am)... he went to the gym early today...came outside and has a flat tire! Oh My Gosh... I'm so thankful that wasn't me (sorry honey)... I couldn't change a tire to save my life... not strong enough! He's limping over to a gas station and they should be able to help him. Today I get to have lunch with my girlfriend, Merryanne... then later this afternoon it's over the bridge to my hairdresser. Isn't it funny how your hair drives you nuts when it's time for a trim? Then you see how "little" they cut off but it's just enough to give you that..."aaaaaahhhhh" feeling...that it's no longer bugging you! 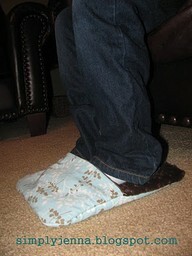 Then it's back home to get things ready for Thanksgiving... yep... clean house.... prepare yummy food.... I really do love to cook for Thanksgiving. There is nothing that smells better than a turkey in the oven! Hey....take a peak at this! I think I need to make me one of these to use while sitting at the computer. For some reason...my feet are always freezing. It must be the way the circulation is being cut off from my feet by the way the chair seat fits my legs.... ! Pretty darn clever! When I saw this shirt... I burst out laughing...! 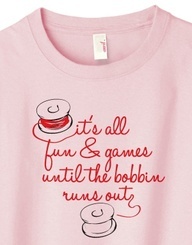 This past weekend - we all had issues with our bobbins in our machines. Julie was so funny...she kept saying... I can't believe I still have thread on my bobbin... (several times she said this...). Brittany kept running out and HATES to wind bobbins. Mine ran out right at a crucial time of my piecing... THEN... Julie finally ran out of bobbin! HA! We should have been called the Bobbin girls!! 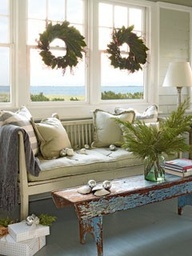 I'm just showing you.... see that sweet little chippy paint blue bench/table in front of the sofa? Well, I sssssooooo wish it were mine! I love this look. I know... I know... some of you think it's "icky"... old and ugly... but NOT me... !!! I think it's especially wonderful when mixed with regular furniture pieces. A little old with the new. You see it all the time in the magazines and on the home decorating shows! 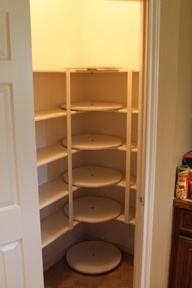 Here's another wonderful idea for your kitchen pantry or any closet that has corner shelves. Simply purchase (or have your honey make for you) circular lazy susans!!! You can buy them at a pretty reasonable price. They don't even have to be this large. Now you can place smaller items in the corners and still be able to find things! How Clever!! One of my favorite things during the holidays is Gingerbread! I love to eat it... bake it... decorate with it!!! 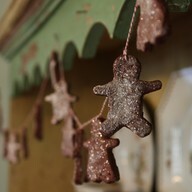 Look at this adorable garland of gingerbread boys and girls! You can put small holes in their heads (sorry little ones) and then string your garland through them...knotting at each one. They are even more adorable if you spay them with a sticky spray and sprinkle silver or plain glitter on them! That's a safe way to make sure no one EATS THEM during the holidays! 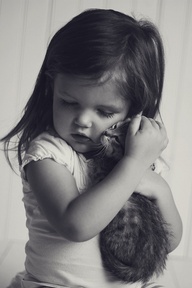 This sweet little kitten is getting the "cheek" love too!!!! Have a wonderful day ..... Hug someone and tell them you love them!